"Tezeta (The Ethiopian Armenians)" is a new documentary about the Armenian influence on modern Ethiopian music. The Arba Lijoch (Forty Children) by Haigaz Boyajian, royal photographer of Ethiopia. In honor of Ethiopian History Month (okay there is no such thing really, everyday is Ethiopian History Month with me) and a new documentary that’s in the works called Tezeta (The Ethiopian Armenians) let’s take a look back at the captivating origin story of modern Ethiopian music. Not too long ago, I wrote about Buda Musique’s Éthiopiques, a collection of rare jazz, soul, funk and traditional folk records from Ethiopia’s past. The collection has brought Ethiopia’s rich and diverse musical legacy to the masses a world over and has caught the attention of other musicians, particularly hip hop artists and producers. I compiled a short list of artists that sampled from the collections many compilations. In 1924, the Prince of Ethiopia, Ras Tafari (yes, the religion was named after him), visited Jerusalem. While walking through the Armenian Quarter with his entourage, he came across a marching band of forty children. Their talent made a profound impression on the young prince. Upon inquiring about the young musicians, Tafari learned they were orphans of the Armenian genocide and with permission from the Armenian Patriarchate of Jerusalem, adopted them, bringing the Arba Lijoch (Forty Children in Amharic) as they came to be known, back with him to Addis Ababa. It was to be the beginning of a musical renaissance in Ethiopia that unfolded and developed throughout the next few decades. Tafari provided the Arba Lijoch a musical education along with stipends and housing. They came to form the Royal Imperial Brass Band, beginning a tradition in modern Ethiopian music of heavily using brass instruments. The Arba Lijoch were trained by musical director Kevork Nalbandian, also an orphan of Armenian descent. Impressed by their progress and skill, Selassie asked Nalbandian to compose a national anthem for Ethiopia and on the November 2, 1930, coronation day, the anthem, Marsh Teferi was unveiled with the Arba Lijoch performing and Prince Ras Tafari becoming the Emperor of Ethiopia, King of Kings, Haile Selassie I.
Nalbandian and his nephew, Nerses Nalbandian, would go on to lay the foundation of orchestral brass bands into Ethiopia’s musical fabric, a sharp turn from traditional stringed instruments like the pentatonic scaled krar. It was from this foundation that artists such as Mulatu Astatke built walls and installed a roof upon, incorporating traditional Ethiopian folk music, religious music, western jazz and funk to create the distinctly Ethiopian sound of Ethio Jazz. The genre of Ethio Jazz has recently been experiencing a resurgence, but don’t call it a comeback. After Haile Selassie was overthrown and the military junta called The Derg came into power a curfew was enforced, effectively shuttering the bustling jazz scene in the many night clubs that dotted the capital. Even after The Derg was overthrown in 1991 and the curfew was dismantled, the culture of calling it a night early had stuck with many Ethiopians and has only began to change in recent years. But music wasn’t the only area in which Armenians influenced Ethiopia. The Ethiopian-Armenian connection runs deep, but hopefully not deep enough to put you to sleep (Ice Cube reference). They have traded with one another for centuries. They also both were among the first countries to convert to the then new religion of Christianity and even practice the same branch of orthodoxy. Even their alphabets are similar. Tezeta (The Ethiopian Armenians) discusses the Armenian-Ethiopian connection is currently in production and directed by Aramazt Kalayjian. ...the tremendous impact of a small minority of people on the culture of a nation; the struggle to retain cultural identity and remain a viable community; and the role that music played in serving as a bridge between two cultures. To date, we’ve conducted forty-five half-hour to hour-long interviews with Ethiopian Armenians, as well as Ethiopian musicians, historians, and clergymen. Our interviews have been in French, Amharic, Armenian, & English. We’ve filmed concerts, recitals, & church ceremonies. We’ve photographed places and people relevant to the story. We’ve come a long way but we have a lot more to go! 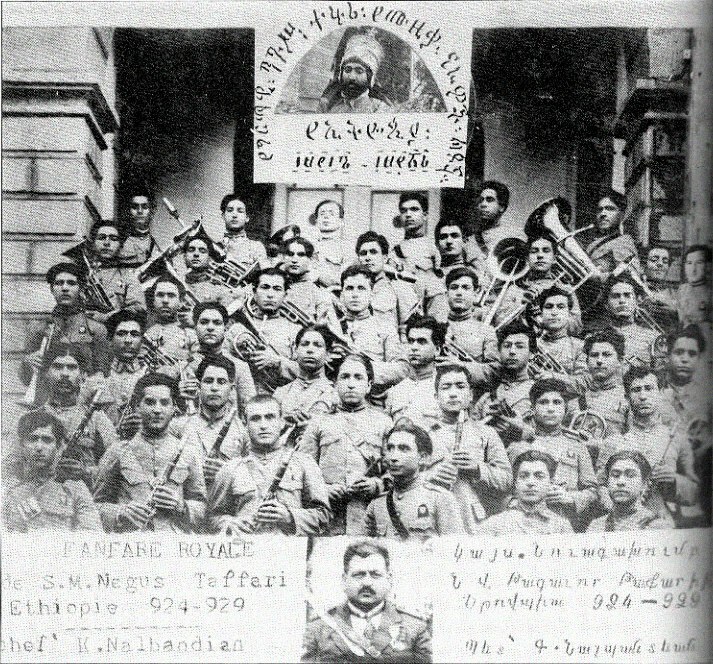 Armenian Ethiopians, although small in number have made significant contributions to Ethiopian music, culture, art and politics (see: Matthew The Armenian). Make sure to watch the twelve minute trailer for the documentary and be on the lookout for more news about the film’s release.